You find yourself on a nicely appointed bike path like this and the idea of turning around just seems wrong. I gave myself a helluva birthday gift today. Herself had proposed that I piss off to Ten Thousand Waves to leach all the venom out of my 61-year-old carcass while she and her visiting pal Lester terrorized Duke City. But I thought a bike ride might serve the same purpose, and without the need to start the car and drive an hour or so north. Being a shrunken, feeble shadow of my once mighty self, I thought riding my age in kilometers would be just the thing. Then the ride sort of got away from me and before I knew it I was well on my way to riding 61 miles. Classify it under, “I knew it was wrong but I did it anyway.” My longest ride this year was a shade over half that, and I had only two bottles and limited grub. But conditions were ideal — 50s at the start, 70s at the finish — and I actually had a cross/head wind out and a cross/tail wind back, which never ever happens. 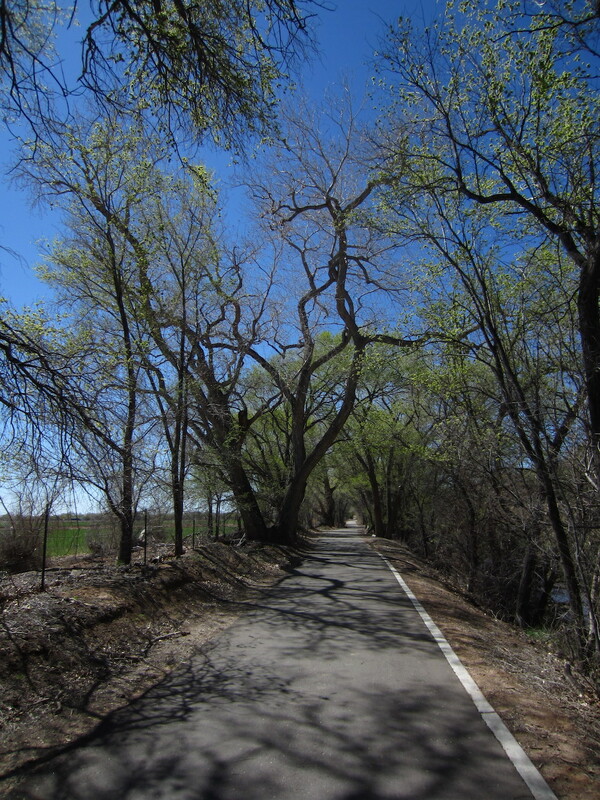 Plus I finally rode the Paseo del Bosque Trail all the way south until it coils back on itself via Rio Bravo. So I can cross that one off the old bucket list. On the homebound leg a brisk tail wind pushed me up Spain toward Tramway, and glad of it I was, too, because it’s mostly uphill from the bosque and I was feeling a tad weary for some reason. The torpor of the aged, no doubt. Anyone care to recommend a nice nursing home? One with secure bike parking? This entry was posted on March 27, 2015 at 7:09 pm and is filed under Albuquerque, Bike stuff. You can follow any responses to this entry through the RSS 2.0 feed. You can leave a response, or trackback from your own site. Every ride is a good one. The fact that you got tail/cross on the way back and great weather is icing on the cake. Happy Birthday! Hope you have a great weekend too. Well, every ride that ends with the rubber side down is a good one. I’ve had a few of the other sort. But this was a good one, and thank you. I haven’t ridden 60 plus miles in 5 years. Forty two was the longest ride last year. Way to go, and happy birthday! I assume you don’t have to cook dinner tonight. Man, I can’t remember my last 60-miler. I did a 50-something a couple years ago, but this was a horse of a different color. It helped very much that the bulk of the ride was pan-flat. Downhill to start, uphill to finish, flat everywhere else. Flat is our friend. As long as you don’t get a flat, which I didn’t. Happy Birthday, OG! Great way to celebrate and the birthday gods were certainly smiling on you. Plenty of time to catch Ten Thousand Waves in the next few weeks. I may need Ten Thousand Waves tomorrow. I think my quads are still in shock. But they’re bound to come to their senses and realize what I’ve done to them. Happy b-day, lordship. Of course you’re sandbaggin’, but wouldn’t we all….. Cheer up David, there is life after 65. I did a 20 mile ride today in the back end of a group with a 87 year old fellow on an older Bike Friday. We averaged 13 mph, and on a flat section we were cruising at 15 mph just chatting away. And, I’m 2 years ahead of you. Thanks for that Pat – I do keep plugging away, but damn, some days it’s a struggle. Happy Birthday! I hope you are celebrating tonight. My man George! Lord, I wish he was still with us. Even when comedy seemed a poor match for reality, George kicked it smack up the hole and told it to get to work. That’s right. Today was your birthday. Happy B’Day, Patrick! Great ride, bask in it! Happy Birthday! Flat? I can stand only a couple of hours of that, far from enough time to ride my age in miles. Might get close to it in kilometers over the vernal equinox holidays as we’re off to Viterbo where there’s some decent (lots of up and down and little traffic) road riding to be enjoyed. Meanwhile the bike racing season’s in full swing. Today I can watch Catalonia and Criterium International stages live on TV followed by taped coverage of Coppi & Bartali…and Ghent-Wevelgem tomorrow! I like a nice flat ride now and then for skull-flushing purposes. Just shut down the brain and let ‘er roll. It was hard to find a ride like that in Bibleburg — the ground had a habit of rising and falling in those environs, and all the best rides had far too much climbing and descending for letting the mind wander. There’s a nice little climb just around the corner in the other direction, through Cedar Crest and up to the Sandia Crest. I haven’t done that one in years. I’ll need a few more long rides under my bibs — and a lot more climbing — before I tackle that one. Happy Birthday! Mine was a week ago. A 61 mile motorcycle ride tires me out these days! You seem to be aging a lot better than I am. Happy Birthday! My husband of 40 yrs. this Sept. does the Saturday World Championship ride with guys that are 40-60,and sometimes younger. He will be 72 this Dec. He is right there with them. The love of my life! All of this was starting to make me feel a little old. Then I think of our Uncle Harold. He’s Sandy’s uncle, so I didn’t get any of those genes.